For Hindus, the goddess Lakshmi symbolizes good luck. The word Lakshmi is derived from the Sanskrit word Laksya, meaning "aim" or "goal," and in the Hindu faith, she is the goddess of wealth and prosperity of all forms, both material and spiritual. 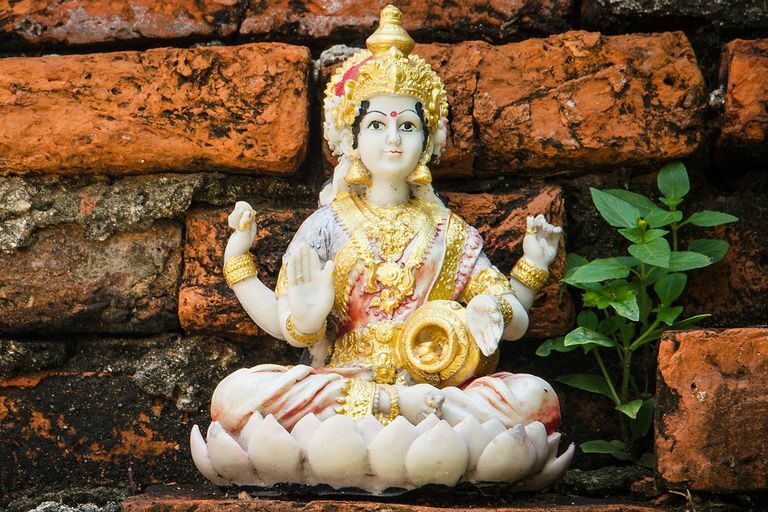 For most Hindu families, Lakshmi is the household goddess, and she is a particular favorite of women. Although she is worshiped daily, the festive month of October is Lakshmi's special month. Lakshmi Puja is celebrated on the full moon night of Kojagari Purnima, the harvest festival that marks the end of the monsoon season. Lakshmi is said to be the daughter of the mother goddess Durga. and the wife of Vishnu, whom she accompanied, taking different forms in each of his incarnations. Lakshmi is usually depicted as a beautiful woman of golden complexion, with four hands, sitting or standing on a full-bloomed lotus and holding a lotus bud, which stands for beauty, purity, and fertility. Her four hands represent the four ends of human life: dharma or righteousness, kama or desires, artha or wealth, and moksha or liberation from the cycle of birth and death. Cascades of gold coins are often seen flowing from her hands, suggesting that those who worship her will gain wealth. She always wears gold embroidered red clothes. Red symbolizes activity, and the golden lining indicates prosperity. Said to be the daughter of the mother goddess Durga and the wife of Vishnu, Lakshmi symbolizes the active energy of Vishnu. Lakshmi and Vishnu often appear together as Lakshmi-Narayan—Lakshmi accompanying Vishnu. Two elephants are often shown standing next to the goddess and spraying water. This denotes that ceaseless effort when practiced in accordance with one's dharma and governed by wisdom and purity, leads to both material and spiritual prosperity. To symbolize her many attributes, Lakshmi may appear in any of eight different forms, representing everything from knowledge to food grains. Worship of a mother goddess has been a part of Indian tradition since its earliest times. Lakshmi is one of the traditional Hindu mother goddesses, and she is often addressed as "mata" (mother) instead of just "devi" (goddess). As a female counterpart of Lord Vishnu, Mata Lakshmi is also called "Shr," the female energy of the Supreme Being. She is the goddess of prosperity, wealth, purity, generosity, and the embodiment of beauty, grace, and charm. She is the subject of a variety of hymns recited by Hindus. The importance attached to the presence of Lakshmi in every household makes her an essentially domestic deity. Householders worship Lakshmi as a symbol of providing for the well-being and prosperity of the family. Fridays are traditionally the day on which Lakshmi is worshipped. Businessmen and ​businesswomen also celebrate her as a symbol of prosperity and offer her daily prayers. On the full moon night following Dusshera or Durga Puja, Hindus worship Lakshmi ceremonially at home, pray for her blessings, and invite neighbors to attend the puja. It is believed that on this full moon night the goddess herself visits the homes and replenishes the inhabitants with wealth. A special worship is also offered to Lakshmi on the auspicious Diwali night, the festival of lights.